I thought I'd try two different approaches to today's sketch. This first one is a one layer, all stamping and no patterned papers. I scored several lines across the top to create that top panel of the sketch and used the lacy pearl ribbon to create the middle panel with the sentiment. And here is one with patterned papers and only a stamped sentiment. I thought if I put the bird on the ribbon this card could be used for male or female. 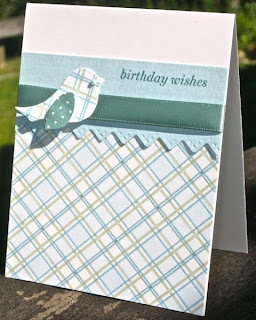 The patterned paper is from DCWV Linen Closet. The bluish lines in the plaid are actually sparkly but you can't see that in the photo. I used my Bird Nesties from Spellbinders for the bird and the wing is actually a leaf from a Sizzlet die. 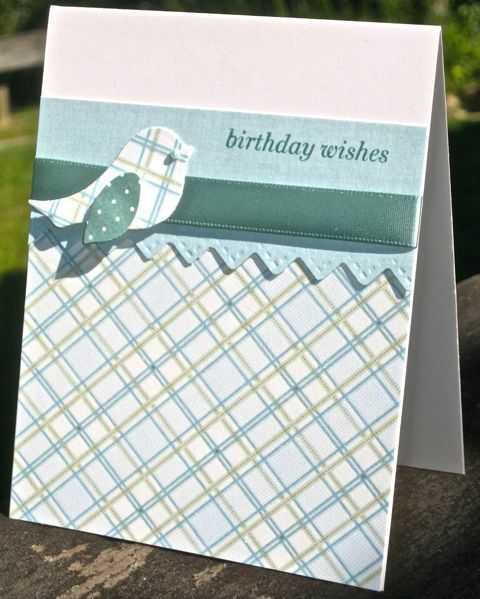 I love all your cards but the blue plaid / bird one is scrumptious! Absolutely love that 2nd card!!! Gorgeous. Those are both absolutely STUNNING cards! Very nice cards, but I'm really loving the one with the bird on it. Very inspiring! So clean and refreshing...I love them both! What pretty cards, and such a nice sketch. I like how you added the scored lines, they are eye catching. The first card is so elegant and pretty. I like the pearl/lace trim. The second card is so cute in plaids. 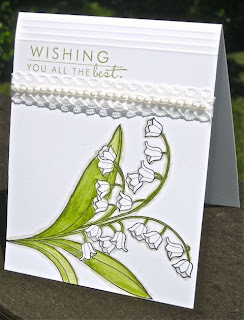 I love both cards, & will have to get the PTI flower stamp. It is elegant. I have the paper & a bird cutout you show in card 2. Thanks for giving us new idea's!